On a clear, cool day in early December 2015, months of research and planning came together at the 19th century Cleng Peerson Farm-Colwick Farmstead in Bosque County. What had started as a seemingly simple inquiry to the THC's History Programs Division turned into an amazing journey of discovery that united two communities from across the world in the pursuit of listing the farmstead in the National Register of Historic Places (NRHP). 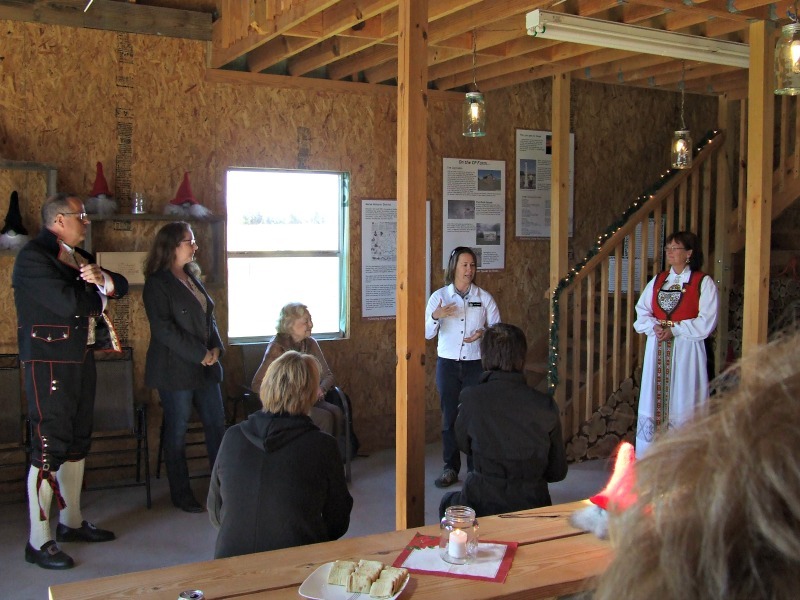 The success of this collaborative research between landowners, community, THC staff, and volunteers was celebrated during the weekend of the Norwegian Country Christmas Tour, with a special delegation from Tysvær, Norway, in attendance. Several years ago, Thomas Mannes and his wife Eldbjørg Djønne-Stuve came to the Norwegian settlement community of Clifton, Texas, and discovered that the last residence of Cleng Peerson, father of Norwegian settlement in Texas, was nearby. They subsequently purchased the property, which led them to seek preservation of the homestead remains. Thomas and Eldbjørg hail from Tysvær, the same town in Norway where Peerson was born. Between 1854 and 1872, under the guidance of Peerson, Ole Canuteson, and Carl Engebretson Quaestad, there was an influx of Norwegians along the Bosque River, and evidence of this heritage is seen in the architecture of Clifton to this day. The journey of discovery began with an examination of archival records and historic documents. 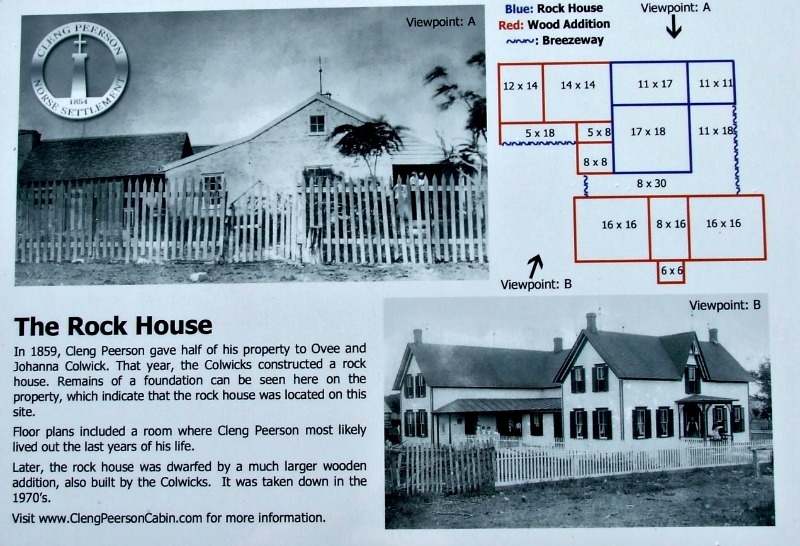 Specifically, deed records, community histories, newspaper articles, and documents associated with a THC historical marker indicated that the property was indeed the last residence of the settlement founder Cleng Peerson. Yet there was very little physical evidence left of the 19th century farmstead except for a log building and piles of architectural rubble. With architectural evidence so sparse, History Programs Division staffers Greg Smith and Carlyn Hammons referred Mannes to me—as the THC's regional archeologist—and to members of the Texas Archeological Stewardship Network (TASN), Bryan Jameson and Art Tawater. The goal of the archeological investigations was to survey the property and locate evidence of the farmstead. After their initial field survey, Jameson and Tawater quickly realized there was an abundant amount of structural remains from the three-room rock home built by the Colwick family in 1859. The original State of Texas Land Grant of 1857 gave Peerson 313 acres of land and in 1859, Peerson gifted 153 acres of his property to Colwick in exchange for care and a place to reside in his aging years. Several of the Colwick family histories mention a three-room rock house, and also noted that Peerson lived in the back room of the house. The key to discovering the original homestead location was when Jameson and Tawater uncovered the remains of the rock house by removing the architectural rubble and push piles of vegetation to uncover the house cellar. 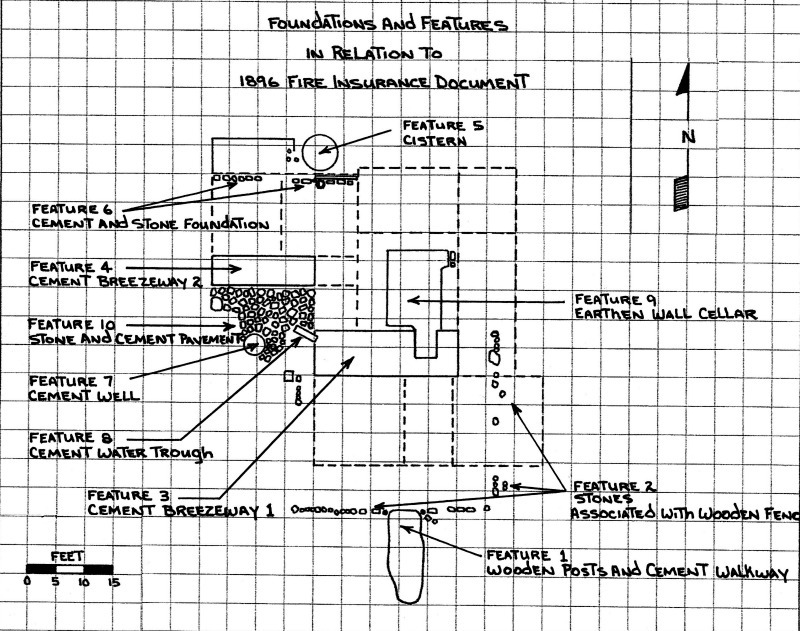 With the use of an 1896 Norse Mutual Fire Insurance document housed in the Bosque County museum, they were able to reconstruct the layout of the original rock house and subsequent wooden additions that were made as the Colwick family grew. Although the construction date of the log building is unknown, based on building trends on Norwegian-Texan farmsteads in Bosque County, the log building was likely erected between 1855 and 1875. Excavations of the Colwick House revealed an intact, earthen-walled cellar with evidence of an original entryway that was blocked at a later date when a new entryway was created. When the property was cleared of excess vegetation, features attributed to the house were also uncovered, including cement and limestone blocks associated with the house foundation, a cistern, a well, the remains of fencing, a concrete trough, and multiple walkways and breezeways. Household artifacts included square-cut nails, ceramics, glass, and metal objects. The Colwick family cemetery was located to the southeast of the house. Stones attributed to grave boundaries were all that remained of the Colwick family cemetery, which had been relocated in the 1960s. After these excavations, the archeological evidence clearly supported the archival records that this was indeed the location of the three-room rock house where Cleng Peerson spent his final years. 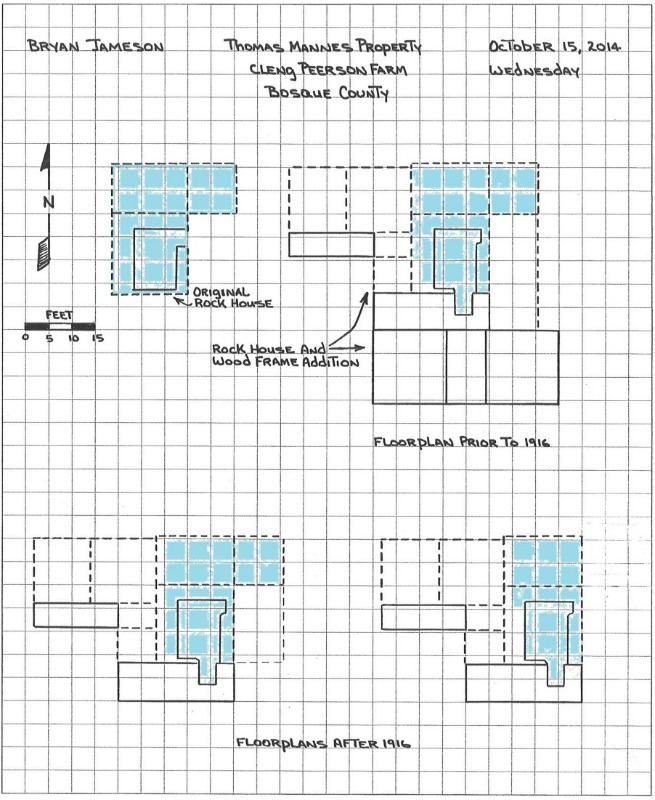 In order to nominate the property to the NRHP, several additional steps were required. Hammons and I assisted with the preparation of a nomination form that compiled the results of the Jameson and Tawater investigations and placed the research into regional and statewide context. Specifically, in 1979, a historic resource survey identified more than 100 Norwegian-Texas homesteads with extant historic resources, yet there were only 20 extant stone houses (locally called “rock houses”) and five log buildings constructed between 1855 and 1885. These represented the earliest phase of Norwegian settlement in the area. Interestingly, the Colwick Farmstead falls within the geographical, chronological, and historical contexts prepared under the 1983 “Norwegian Settlement of Bosque County” thematic resource nomination, yet it does not appear in the survey records. This is likely because at the time of the survey, there were no apparent above-ground historic resources, which was the focus of the survey at that time. When the NRHP criteria were applied to the Colwick Farmstead, extensive evidence was found that made the site significant. Since extant examples are increasingly rare, the pre-railroad-era log building is architecturally significant because it allows for study of the material selection and construction techniques available to new immigrants on an isolated frontier. The Colwick Homestead site is further significant for its potential to reveal important information about the earliest Norwegian settlers and to trace the evolution of their lifeways through the eventual process of assimilation. The THC's Texas Archeological Sites Atlas identifies only three other recorded archeological sites affiliated with 19th-century Norwegian settlement. Beyond surface-level survey, none have been investigated. Many of the properties documented as part of the 1983 “Norwegian Settlement of Bosque County” thematic resources nomination were cited for their potential for important archeological remains based upon the observation of surface artifact scatters, but none were subject to additional investigation. 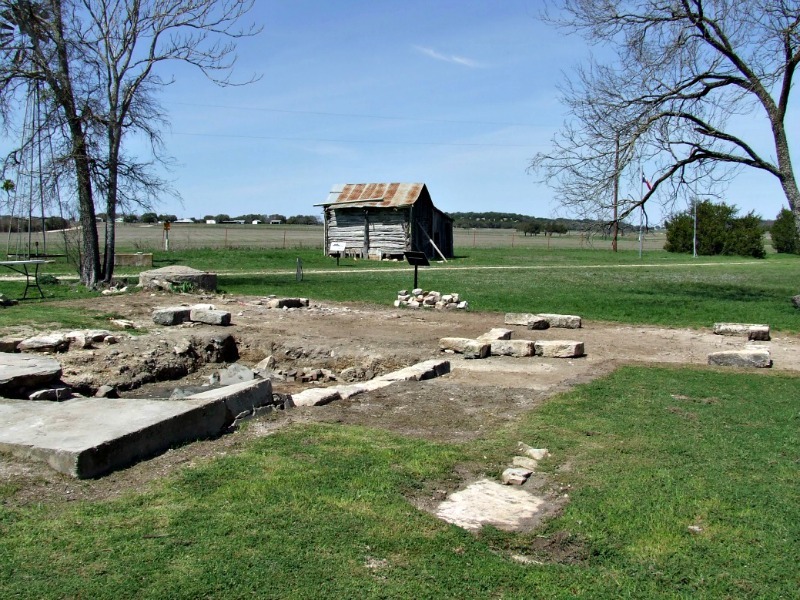 Thus, unlike the homesteads of other ethnic groups to settle in Texas—such as Germans—the homesteads of Norwegian Texans are largely underrepresented in the current historical archeological record. Therefore, not only does the Colwick Homestead allow for study of the evolution of Norwegian lifeways during periods of both isolation and assimilation, but it also allows for a comparison of how that experience may or may not differ from that of other contemporaneous ethnic groups. Pictured from left to right: Thomas Mannes, Becky Shelton (THC), Mary Orbeck (Colwick family member), Carlyn Hammons (THC), and Eldbjørg Djønne-Stuve discuss the listing of the Colwick Farmstead in the National Register of Historic Places with the landowners and guest.